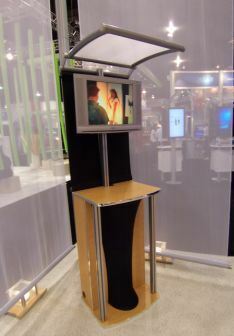 Add a retail display kiosk or tower to your trade show booth and instantly create an interactive information center— perfect for video or computer demonstrations. E&E Exhibit Solutions can create a retail display kiosk or tower structure to best enhance your interactive display needs. We also have kiosks that are trade show charging stations. An exhibit kiosk or tower works well as an addition to your existing booth or island display, but also adds a professional and functional interactive display to the most basic booth. Can incorporate graphic wings and headers, monitor mounts for your flat screen, laptop or keyboard shelves, counters with storage or all of the above! RENT Trade Show Retail Display Kiosks: Need a retail display kiosk for a one time use? Consider renting one! Check out our exhibit rentals site for an assortment of choices. Have a question about the right retail display kiosk for your needs?